Stress fractures are a common injury in sports, especially in weight bearing bone, however it is not uncommon to find them in non-weight bearing bones where load fatigue is seen. Elite rowers are one such group and experiencing a rib stress fracture (RSF) can have significant long-term significant consequences, as slow healing and recovery can prevent participation in training and competition. Stress fracture occurs when a bone fails to withstand repetitive bouts of mechanical loading. This loading results in bone strain, which on its turn may cause micro-damage. With normal physiological loading this micro-damage will be healed through the bone remodelling. With repetitive loading, however, an imbalance between the remodelling and micro-damage may occur, causing a stress fracture. altered movement and distribution of stress caused by muscle fatigue.This causes excessive force to be transmitted to focal areas in the bone. rib cage compression or the prevention of compression caused by the strong force of muscle as it acts on bone resulting in an accumulation of damage. Micro-damage follows a threshold-principle: an increase in bone strain above a certain level leads to an increase in micro-damage . Bone strain which is induced over a shorter period results in a significant increase in the development of micro-damage(ref). It could be concluded that factors increasing the magnitude and rate of rib loading contribute to the formation of micro-damage, resulting in stress fractures. Whilst rowing, there is only a small impact on the ribs therefore micro-damage is the result of sources other than the forces associated with impact loading. Therefore the mechanism of injury is thought to be multifactoral and more likely a combination of muscles, joints, rowing technique and rowing equipment. Pressure applied by the abdominal muscles on the sternum and lower ribs result in a loading of the entire ribcage. Radiological evidence shows a large amount of ribcage compression in the final stage of rowing, caused by the abdominal muscles . 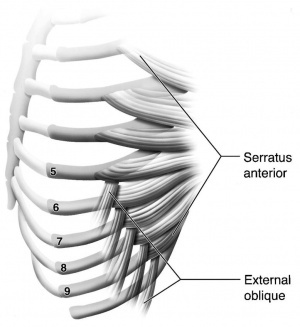 SA protects the ribs by resisting the abdominal rib loading at the end phase. Fatigue of the SA results in a decrease of force production, which leads to a decreased buffering of power applied by the abdominal muscles. The costovertebral and costotransversal joints are the most important joints in the ribcage and form a mechanical connection between ribs and thoracic vertebrae. This mechanical connection enables the ribcage to provide protection to the thoracic region by redistributing the transmitted forces to the thoracic spine. Oar: since the 90’s, smaller and shorter oars made out of carbon are used. These oars are easier to use, but result in a larger loading since a greater force is generated at the handle when applying the same load. This exposes the ribs to a greater level of strain. Boat: larger boats increase the development of stress fractures. The larger the boat, the larger the water resistance and the bigger the oars needed to provide the necessary resistance due to leveraging. Positioning: bow rowers have a smaller chance at rib stress fractures because they have to apply a smaller force, at a lower rate. The first skeletal factor which triggers the formation of rib stress fractures is the bone geometry. A narrower bone leads to a smaller cross-sectional area moment of inertia, which is an important factor in the ability of a bone to resist bending . Second important skeletal factors are the properties of the bone material. A low bone density causes a decreased resistance against fatigue, resulting in the development of stress fractures. Rapid changes in the training modalities can interrupt the relative homeostasis between micro-damage and the recovery of micro-damage. This causes an increase in the amount of active remodelling units, which will result in a decrease of bone elasticity. This will result in an increased strain, causing an increase in micro-damage. Women run an increased risk at stress fractures at any location of the body . This can be explained by gender-specific endocrine factors which alter the recovery response of the body to micro-damage. We see that physically active women have a higher prevalence in menstrual disturbances causing a decrease in bone turnover and formation. The symptoms can range from a generalised pain in the rib area, persisting with activity and gradually becoming more specific, to a palpable bony callus with increased pain when pressure is applied. In the worst case the rower experiences pain when breathing deep or rolling over in bed. The fractures are often located on the antero- or posterolateral side of the ribs. A bone scan or an MRI are the best ways to detect a stress fracture, although it may take a few months before there is real evidence of callus formation. A sonography or an RX can also be used to diagnose. The treatment consist of 4 up to 6 weeks of relative rest, where the rower is allowed to do everything within his pain threshold. Exercises on stability are very important. Strengthening exercises for the serratus anterior are recommended. Normally they should lead to increased power and additional loading on the rib cage. In the case of costovertebral and costostransverse joint stiffness, passive mobilisation of the thoracic spine and costovertebral joints is advised as treatment. Rowing is not advised, since it is often painful and since it is the cause of the fracture. When working on an ergometer, one must see at it carefully that the old flaws in technique are handled. Application of ice will diminish the pain, but does not heal the stress fracture. Over-reaching: this occurs when the rower comes back in and stretches too far forwards pushing their shins passed the vertical position. This results in a weak starting position for the following drive phase, increasing the injury risk. Rowers need good basic aerobic condition, mobility and flexibility of the trunk, arms and legs, and physical strength, speed and endurance. In general, the training programme consists for 60 to 70% of aerobic training and 30 to 40% anaerobic training. Serratus Strengthening: before starting the exercise it is very important to ensure that the patient is able to maintain the scapula in the proper position. Secondly we ask the patient to place his/her both hands, shoulder width, against the wall in an extended arm position. Then instruct the patient to pull the 2 margo medialis scapulae to each other and return to starting position. the intensity could be increased by either adding more repetitions or modifying the exercise into a weight bearing positions by placing both hands on the ground in a kneeling position. In the following stage we ask to the patient to lie down on his/her back, holding 2 dumbbells in hands with extended arms and perform scapular protraction. Starting with a light weight/high repetitions then progressing to heavier weight/few repetitions. Furthermore, pull down exercises could be used: patient holds the bar with two hands in extended arm position. Trunk and arms should form an angle of 100° in starting position with legs in 15° flexion. We ask the patient to pull the bar in the direction of his thighs and back up. The back up phase should take a little longer (3 seconds) than the pulling phase (2 seconds). Dumbbells pullover: patient lies down with his upper back across a bench and his body perpendicular to the bench. Both arms are extended above chest holding a dumbbell with both hands. The patient should lower his/her arms above the head and reverse the movement on the way back up. Using a medicine ball instead of a bench or raising the weight may increase the difficulty of this exercise.